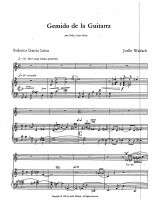 Gemido de la Guitarra is a long song, almost a concert aria, based on a 1921 poem, La Guitarra, by Federico Garcia-Lorca. The poem was inspired by Lorca’s extensive research (with daFalla) into the cante jondo, the indigenous poetry and song of southern Andelusia. 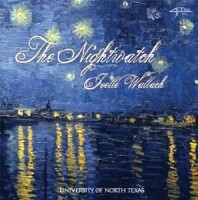 Wallach’s song, like the Lorca poem it is based on, reflects the passion and mystery, the profound and abiding anguish of the realm of the gypsy guitar. In describing this tradition, Lorca wrote: The figure of the cantaor is found within two great lines, the arc of the sky on the outside, and on the inside the zigzag that wanders like a snake through his heart. When the cantaor sings he is celebrating a solemn rite, as he rouses ancient essences from their sleep, wraps them in his voice, and flings them into the wind…. He has a deeply religious sense of song. Through these chanters, the race releases its pain and its true history….They were prodigious interpreters of the peoples’ soul who destroyed their own hearts in storms of feeling. Sonando Sueños de Tango is an art song in which characteristic gestures of the Argentinian tango are used. It was written in 1985 for performance in a program of tangos and zambas presented by the Americas Society in New York City. 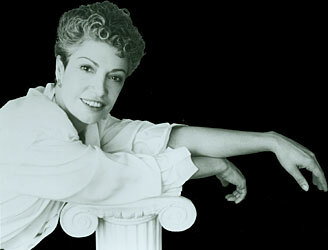 The poet is Graciela Perez Trevisan, an Argentinean woman currently residing in San Francisco. Los Ojos is based on a poem of the same name by the 20th century Spaniard, Antionio Machado. In the song, silence is an analogue for the stark emptiness of the protagonist’s emotional landscape. 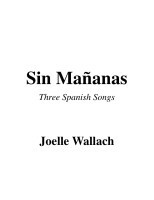 Sin Mañanas: Three Spanish Songs is recorded on the Opus One label.